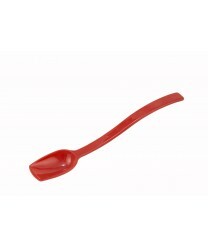 The curved 10" handle of the Winco PSSB-10R Red Salad / Buffet Spoon, 3/4 oz. gives it a comfortable grip when serving any type of food. Made of durable polycarbonate, this red buffet serving spoon can be used at salad bars, cafeterias and on the buffet line for quick and efficient self-service. Winco BW-SS1 Solid Deluxe Serving Spoon, 11-3/4"
Winco PSSB-10C Clear Salad / Buffet Spoon, 3/4 oz.